The 32nd Annual Mermaid Parade gets rolling on Saturday at 1:00pm. 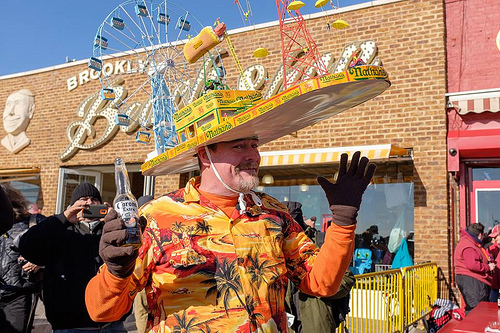 The free event is one of the most hugely crowded days of the year in Coney Island. If you’re not marching, where are the best places to spectate and take photos? Anywhere along Surf Avenue from the parade’s starting point at West 21st Street to West 10th Street, where it turns to go onto the Boardwalk. You’ll miss the antique cars and motorized floats if you opt for the backdrop of the Cyclone on West 10th and the seaside atmosphere of the boardwalk. This year, the parade disbands at Steeplechase Plaza, where the Parachute Jump is located on the boardwalk at West 17th Street. 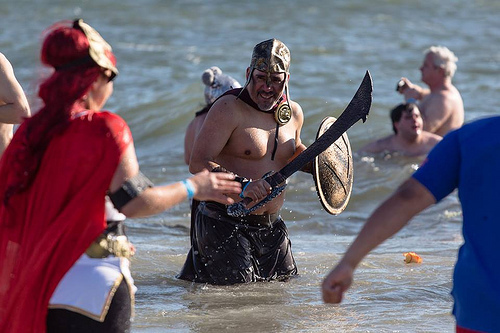 On New Year’s Day 2011, when Santa should have been back at the North Pole after a busy Christmas, photographer Barry Yanowitz spotted him at the Coney Island Polar Bear Swim! The annual event is zany fun as well as a fundraiser for a very good cause. You can play Santa on New Year’s Day 2012 by pledging a donation to this year’s plunge or helping participants meet their fundraising goals. The funds make it possible for children with life-threatening illnesses and their families to enjoy a holiday at Camp Sunshine in Maine. 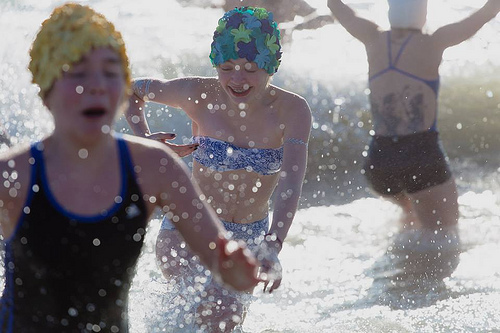 There’s no fee for observers or participants at the increasingly popular annual event, but the Coney Island Polar Bear Club encourages participants to make a donation to Camp Sunshine. They will receive a free breakfast, all-day admission to the New York Aquarium and the official “I Did It!” certificate. Swim time is at 1 pm sharp. Registration begins at 11 am on the Boardwalk at Stillwell Avenue. Before and After Party at Ruby’s Bar from 11am till 2:30pm! Created by Betty from the JASA poets in Coney Island, on June 15th, 2011 with Amanda Deutch and Gary Glazner of the Alzheimer’s Poetry Project. 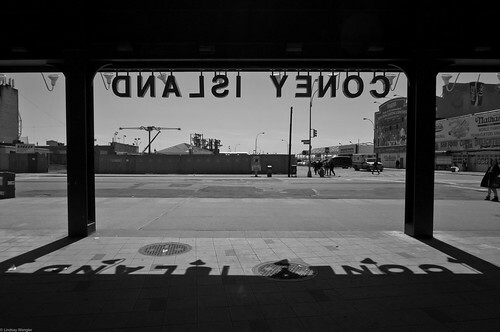 So much happened in Coney Island. My mother never had to look for me. Some people didn’t think much of Coney Island. I got off at Avenue U so he wouldn’t know where I was from. 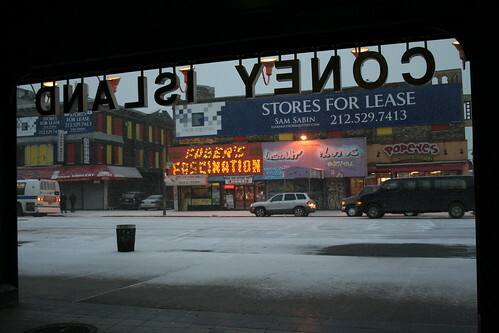 I was happy to be from Coney Island. It’s a beautiful place to live. The story of how Nathan’s began is interesting. I was always an outside girl. I lived close to Neptune and Surf. I walked on the sand. I walked by the ocean in my boots. On the coldest days we sat on the rocks. On the coldest days that’s what we did. You can even have a story about the pier. I used to watch them fish. When I was married on Mermaid there was a rainbow in the window. I used to see a rainbow from my window. You have to find beauty. You can go down one of those hills. You’ll have a long life. When you hit the top all of sudden you couldn’t catch your heart. When Luna Park was burning I never saw such a sky in my life, a red sky. I heard the fire trucks; I looked out the window. The next morning, I learned Luna Park had burned. I could see the moon from my window. The moon was better than being on earth. I wanted to stay up there. The Alzheimer’s Poetry Project was founded in 2004 by Gary Glazner and has served over 9,500 people living with Alzheimer’s disease. They have also developed poetry workshop models for early stage dementia groups. For more information on this award-winning project, visit their website http://www.alzpoetry.com. Glazner is a poet and author whose books include Sparking Memories: The Alzheimer’s Poetry Project Anthology and Ears on Fire: Snapshot Essays in a World of Poets. Amanda Deutch is a teaching artist and poet whose mother and grandparents lived in Coney Island. Her poetry is published in dozens of literary journals and her poem “30,000 City Windows” was nominated for a Pushcart Prize. She is the founder of Parachute: the Coney Island Performance Festival and recently launched a Poets Walking Tour of Coney Island.